Dawn found us back at the Alda bridge, in a light breeze and light sleet, listening to the cranes wake up and the endless flocks of snow geese overhead. As the skies grew brighter, against all odds, Danny picked a white dot out of the vast crane islands — an adult whooping crane, almost certainly the one we had enjoyed a few days earlier just a mile or so down the road. The weather wasn’t improving, so we pushed on to Gretna and Schramm State Park, where all was quiet but for a noisy belted kingfisher nervously hunting the old fish ponds. A walk along the densely wooded blufftops was hardly any birdier, with a heard-only myrtle warbler our only feathered reward. The drive back to Omaha should have been shorter than it was, and traffic was still jammed when it came time to head out for dinner. But we got there, and slept the happy sleep of the bird-sated as we looked forward to the return home. 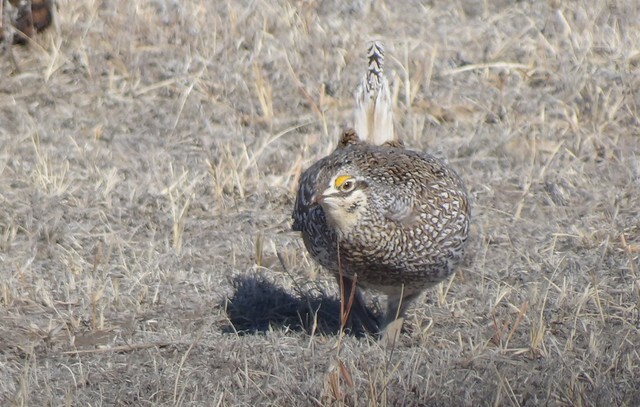 Another early morning and another prairie grouse species in display — this time greater prairie-chickens, 20 minutes straight north of Mullen. 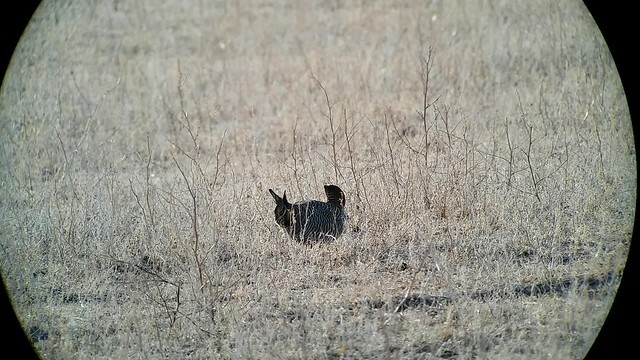 Unlike the whirligig antics of the sharp-tails, the booming of the prairie-chickens is a stately affair, but no less deadly serious to the performers. This lek was a bit on the small side last year, but today we counted no fewer than 32 males at one point, no doubt drawn in by the apparent presence of an early hen or two doing a little window shopping. The eerie moaning was still echoing in our ears when we left the lek for breakfast. 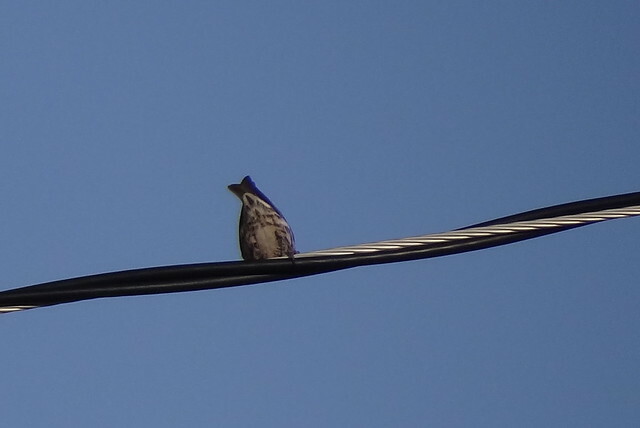 Eggs and hashbrowns sounded awfully good, but we wound up making one unscheduled stop for a big dark bird on a telephone pole. 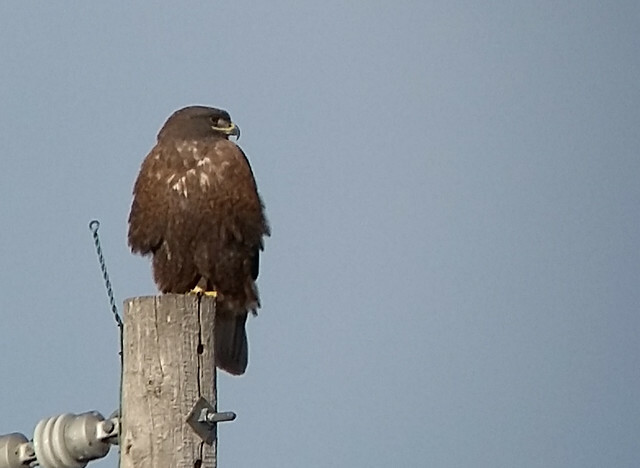 Ferruginous hawks are uncommon winterers and scarce breeders in the Nebraska Sandhills, and we don’t always get the lingering views this one granted us; we were even able to step out of the shuttle for photos, and the bird was still perched above the road when we left. After breakfast — another good one at the Meadowlark Cafe — we bade farewell for the drive south to North Platte, interrupted by a quick stop to look at a couple of roadside pronghorn (much better views than the pair we’d had at a distance the day before). 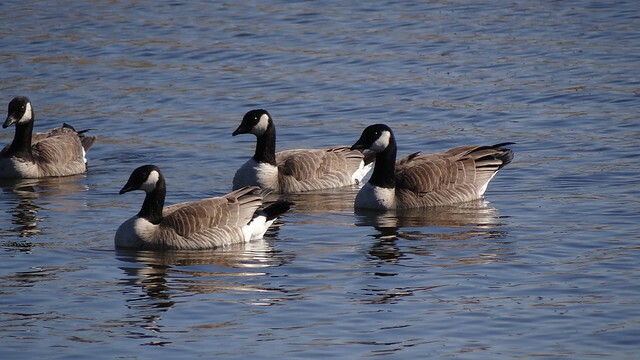 The pond at Cody Park gave us the expected close views of cackling geese, often standing or swimming right next to Canadas; there was also a lone trumpeter swan, and the usual congregation of ducks included scattered redheads, common goldeneye, and lesser scaup. And then back to civilization — or at least to what passes for civilization in the form of interstate 80. We zipped along to Grand Island, checked in to our hotel, and had dinner before driving south to the Alda bridge for another fine evening with the cranes. The stiff breeze cleared the human crowds out pretty quickly, nd by the time we left there was nothing to hear but the roar of the flocks settling above and below the bridge. Just as it should be. Daylight saving time and Mullen’s position right on the eastern border of the Mountain Time Zone came together to let us sleep in — kind of. 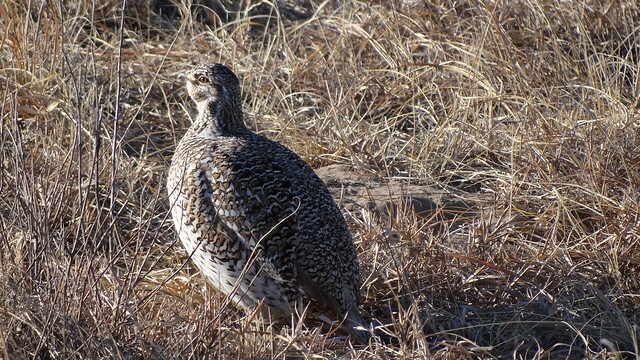 We were in the shuttle at 5:30 this morning and on our way to the lek of the sharp-tailed grouse, about 25 minutes east of Mullen (and back, I think, in Central Time). It wasn’t long before the eastern sky brightened and we heard the first low hoots and cackles of the grouse. 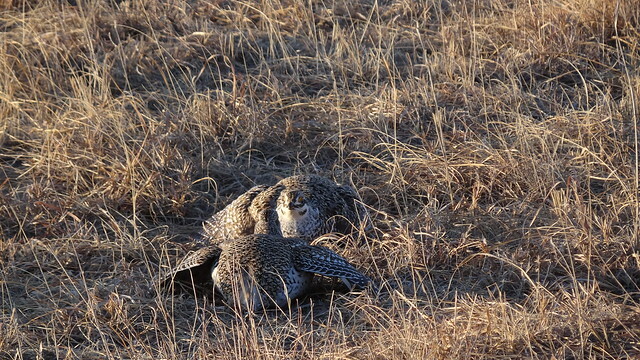 As the light rose, we saw eleven males dancing on the lek, stamping their furred feet and rattling their tail quills as the faced off in the grass. The birds can be a little lethargic this early in the season some years, but they were active, even frantic, the entire three hours we sat and watched. The show was absorbing, but we were still able to peel our eyes away to enjoy a distant Richardson’s merlin tearing her breakfast to bits on the ground below the next ridge. The birds took a break about 9:00, and we seized the opportunity to step back into the shuttle and ride to a well-deserved big breakfast in Mullen. 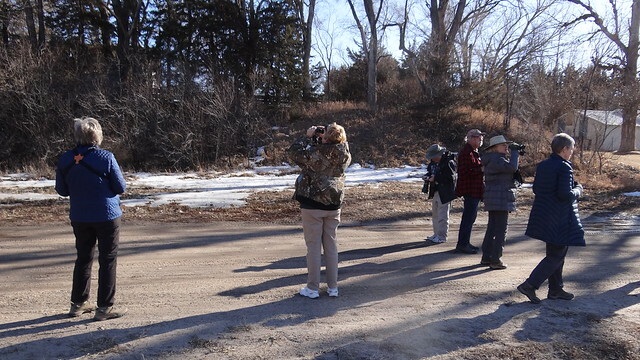 And then, after a break at our motel, it was more birding for those who wanted to come along. There was still ice on some of the big Sandhills marshes to the west, but every patch of open water was nicely packed with waterfowl, especially common mergansers and redheads by the hundreds. 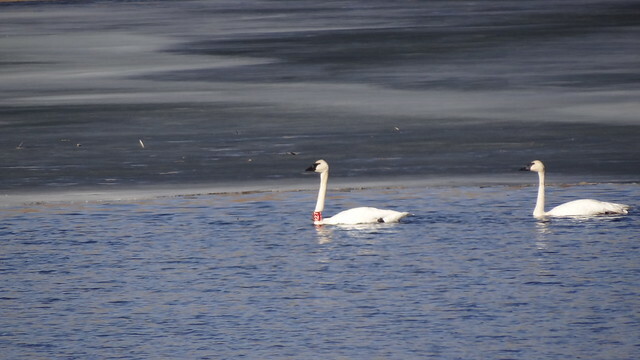 Among the trumpeter swans already in command of their breeding marshes was the bird in the photo above, a male by behavior (and possibly by size), wearing a red neck collar that Jonathan’s photo showed to read “R27.” Eager to hear where and when this one was banded. The Hyannis cemeter has been a minor hot spot of sorts the past couple of years, and it came through again this time when a Townsend solitaire popped out of a red cedar as we got out of the van. 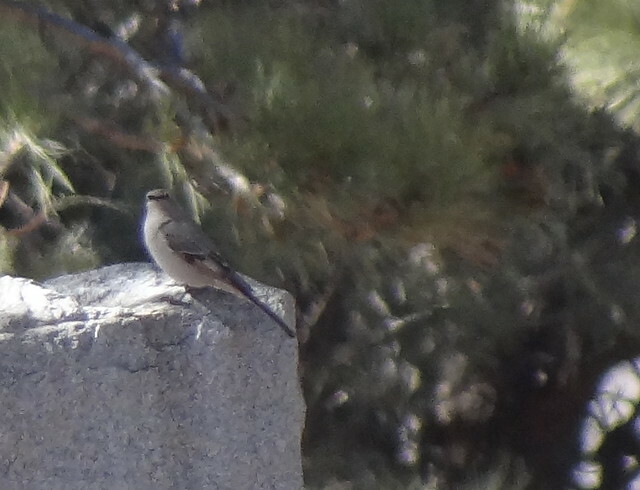 As birds of this species are wont to do, it disappeared into the needles for a few minutes, but then re-appeared atop a gravestone to give everyone outstanding leisurely views — and me this lousy photo. The junco show was less satisfying. As we stood and waited, in vain, for the two or three we had flushed to come back out of the grass, though, another movement caught our eye on the ground beneath the trees. Common redpolls! 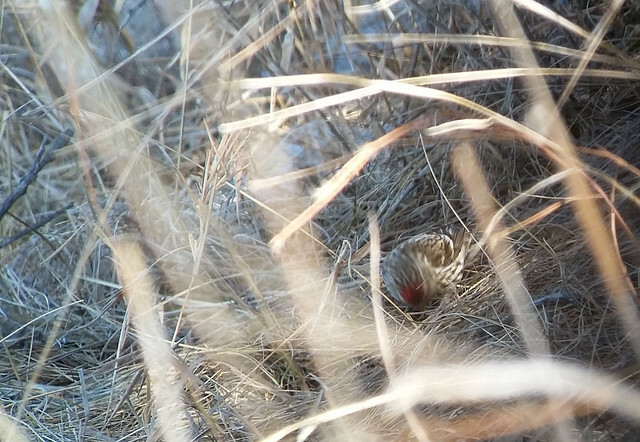 I am almost never in Nebraska when they are, and it was a delight — I think for all of us — to watch this little band of seven feeding quietly just a few feet away. A great end to another bird-filled day. What a day, full of birds and beautiful landscapes. 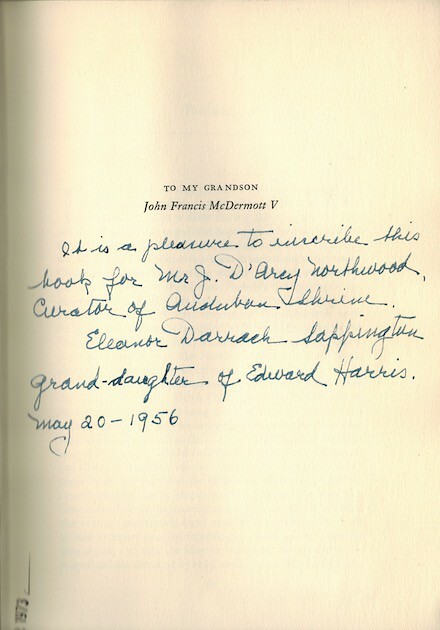 We started at Fort Kearny, where the numbers of sandhill cranes and snow geese were once again beyond belief, vast clouds rising from the water and the fields every time a bald eagle looked cross-eyed at the flocks. We could have stayed all day, entranced by the sound and the sight of sheer abundance. But it was time to leave Platte Valley for the Nebraska Sandhills. 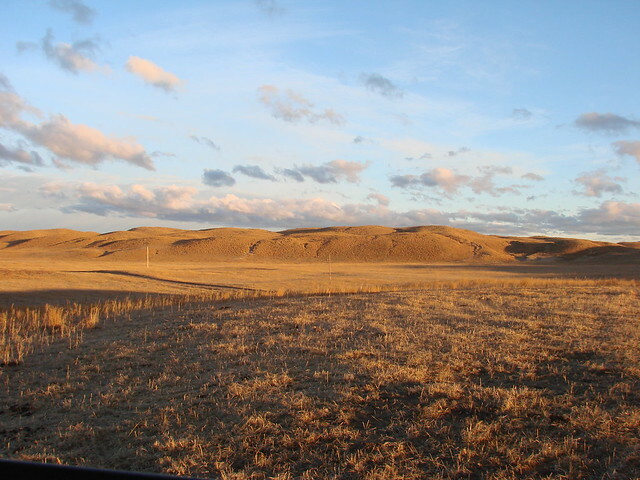 Rough-legged and Harlan hawks, horned larks, and trumpeter swans welcomed us to this twenty thousand square miles of dunes and grass. 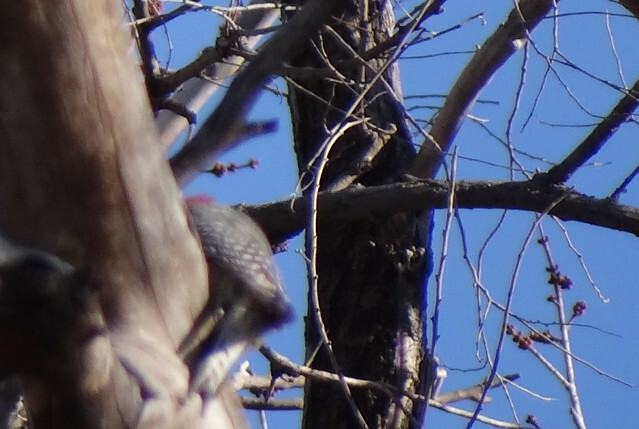 The birding was most exciting, though, once we were in Mullen with time to take a late afternoon walk around town. A Harris sparrow and a red-bellied woodpecker were both mild surprises in this part of the state, and red-breasted nuthatches and pine siskins joined the cedar waxwings and robins bathing vigorously in the melt puddles on the roadsides. I’ll have to look, but I seem to remember having seen the nuthatch only once before on this tour — and the siskin might even be a new species to the cumulative list. 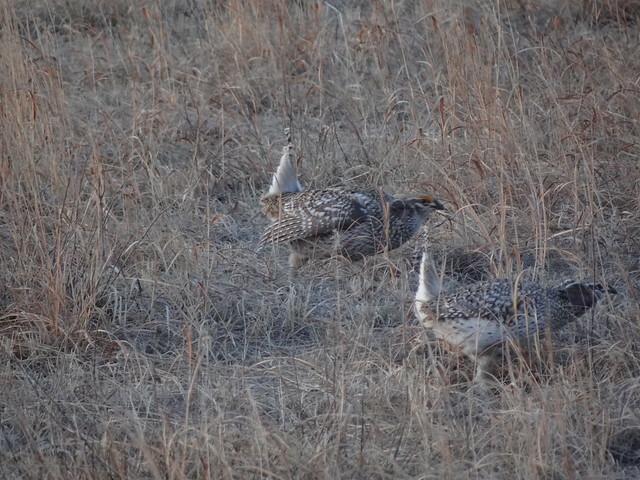 Tomorrow: sharp-tailed grouse and the big marshes of the Sandhills.